When the Islamist radicals of the Islamic State of Iraq and Syria (IS, or Islamic State) decided to send a suicide bomber across the border into a small Turkish town, they probably did not think the bomb attack would poison their relations with Turkey. After all, the bomber's target was a pro-Kurdish group, also viewed with hostility by Turkey. The attack killed 32 people and injured over 100. The attack also prompted tighter border controls in an area patrolled by the Turkish security forces. In an exchange of fire over the Turkey-Syria border, one Turkish non-commissioned officer was killed (the first Turkish casualty by IS fire), along with one IS fighter. That was the end of Turkey's silent, peaceful cohabitation with the jihadists next door. The Turkish military said it sent fighter jets to bomb IS positions in northern Syria. Turkey also, for the first time, joined the allied forces fighting IS by agreeing to allow, after several months of negotiations, the US military to use the critical Incirlik air base in southern Turkey for air strikes against IS targets. The crackdown on IS targets in Turkey reveals how jihadists have been enjoying official protection. Then came police raids against IS targets inside Turkey. Suddenly Turkey, a NATO member, was in an all-out war against IS, inside and outside Turkey. But in an embarrassing reality, the crackdown on IS targets in Turkey revealed how jihadists have enjoyed official protection over the past several years. In one raid, for instance, the Turkish police targeted an Istanbul apartment where it (unsurprisingly) found 30 foreign fighters waiting to be dispatched into Syria to fight their jihad alongside their IS comrades. The police also detained hundreds of "IS members or sympathizers" in raids across Turkey. The IS men must have been shocked at the unexpected hostility they faced from Turkish security forces, something they probably had not seen before. But of all the detainees, two names were more revealing than the other, less-known ones. One was Abdullah Abdullaev, an Azeri jihadist believed to be one of the IS leaders in Turkey. Abdullaev is the man who ran a network that received, provided safe houses for, and dispatched a large number of jihadists into Syria to augment the jihad there. Ironically, Abdullaev had successfully avoided coming onto the Turkish security's radar — a real miracle — until one IS cell with no real vision decided to bomb a pro-Kurdish meeting in a small Turkish town. Then it attacked Turkish troops. 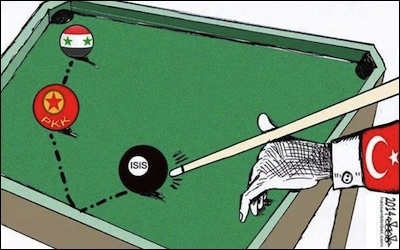 Then Turkey attacked both IS in Syria and pro-independence Kurds in Iraq. Similarly, three pro-IS websites operating in Turkey were abruptly blocked, on court orders. Just like the detained IS operatives, the websites had been free to operate inside Turkey until the first direct combat between Turkey and IS. 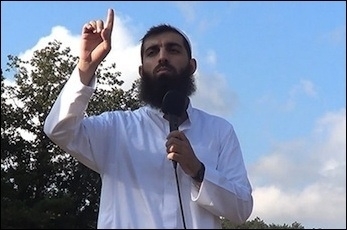 Well-known Turkish Islamist Ebu Hanzala was arrested in 2008 for plotting an attack on a synagogue, but was quickly released after appealing to a higher power. And then there is the curious case of "Ebu Hanzala." Ebu Hanzala is in fact the nom de guerre of Turkish national Halis Bayancuk. In 2008, Hanzala was caught by the police as he was sketching plans to bomb a synagogue in Turkey. Mysteriously, he was released one year later. In 2014, he was briefly arrested again at a pro-Al-Qaeda meeting in Van, an eastern Turkish province bordering Iran. Also in 2014, he publicly declared that he wanted Islamic law (shariah) in Turkey. Bayancuk also declared his commitment to IS in a series of videotapes he released. He even had a Twitter account under the name "Ebu Hanzala." Without the bomb attack against the pro-Kurdish party, Bayancuk would most probably still be a free man, fighting for jihad and organizing some of the traffic on Turkey's jihadist highway, under the discreet surveillance of the same police officers who detained him when they wanted to. It is good news that Turkey is cracking down on jihadists across the country. But questions remain: How, so spontaneously, were the Turkish police able to find the safe house where jihadists were waiting to be shipped to Syria? How did they immediately find and detain Messrs Abdullaev and Hanzala? Why did they let them go free before? It is nice of Turkey to ban the three pro-jihad and pro-IS websites, but why did the Turkish court not shut them down before? Why, specifically, did the Turks let Hanzala go free, despite his proven links with terrorism and specifically with organizations such as al-Qaeda and IS? Why was he released shortly after he was detained in each case? Finally, Turkey is fighting what the entire civilized world views as a brutal jihadist organization. But the way Turkey fights the Islamic State reveals how friendly it may have viewed the group until now. "Ebu Hanzala" is the Turkish version of the Arabic name "Hazrat Hanzala," the son of Abu Aamir Rahib, who was a non-believer during the birth of Islam. Hanzala fought for the Muslims while his father fought for the non-believers. During the Battle of Uhud, Hanzala is believed to have fought with such spirit that he was able to pass through the barrage of soldiers and ultimately reach the non-believers' leader, Abu Sufyaan who later accepted Islam.